LOS ANGELES, Calif. (July 20, 2017) – When Chuck Negron co-penned "I'm on Fire" he included lyrics that were extremely personal and self-reflective of his life story. The ups and downs of the singer's career and personal life have often been played out in the public eye and it's no secret that he endured an infamous battle with drug addiction in the height of his career with Three Dog Night. Now 25 years sober, the video for the song highlights the highs and lows through images and clips from his rock star life. The new album, titled Negron Generations is available now at ChuckNegron.com and all digital music outlets as announced by ABC News Radio. 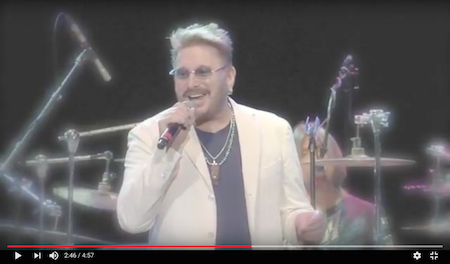 “My hope with this song is that we can reach people that need the inspiration to keep fighting the good fight, whatever that may be for them," said Chuck Negron, "I continue to find solace in my spirituality and it has helped me make it through the past 25 years of sobriety. I recognize that a higher power gave me a second chance at a time I probably didn't deserve one." Three never-before-heard Three Dog Night tracks are included on this release. They were recorded by the band in the mid-1970s prior to their first breakup in 1976. “The Letter,” “Save Our Ship” and “This Is Your Captain Calling” feature that iconic sound that could only come from the original vocalists of Three Dog Night; Cory Wells, Danny Hutton and Chuck Negron. Negron and his daughters, Charlie and Annabelle, created a unique harmony blend that only a family can on the new project. The sisters’ lead vocals on The Ronettes’ “Be My Baby/Do I Love You” are truly compelling. Two Three Dog Night hits re-recorded by Chuck Negron are featured on Spotify playlist Yacht Rockin' Through the Years. Fans can follow the playlist and support him on Spotify. Negron is currently touring for the fourth year on the critically-acclaimed, Happy Together tour, joining The Turtles featuring Flo and Eddie as well as The Association, The Box Tops, The Cowsills and The Archies starring Ron Dante.